With hundreds of ships, and possibly tens of thousands of men, the Vikings arrived outside Paris in late November 885, at first demanding tribute. This was denied by Odo, Count of Paris, despite the fact that he could assemble only a couple of hundred soldiers to defend the city. The Vikings attacked with a variety of siege engines, but failed to break through the city walls after some days of intense attacks. The siege was upheld after the initial attacks, but without any significant offence for months after the attack. As the siege went on, most of the Vikings left Paris to pillage further upriver. The Vikings made a final unsuccessful attempt to take the city during the summer, and in October, Charles the Fat arrived with his army. To the frustration of the Parisians who had fought for a long time to defend the city, Charles stopped short of attacking the Viking besiegers, and instead allowed them to sail further up the Seine to raid Burgundy (which was in revolt), as well as promising a payment of 700 livres (257 kg) of silver. Odo, highly critical of this, tried his best to defy the promises of Charles, and when Charles died in 888, Odo was elected the first non-Carolingian king of the Franks. Although the Vikings had attacked parts of Francia previously, they reached Paris for the first time in 845, eventually sacking the city. They attacked Paris three more times in the 860s, leaving only when they had acquired sufficient loot or bribes. In 864, by the Edict of Pistres, bridges were ordered built across the Seine at Pîtres and in Paris, where two were built, one on each side of the Île de la Cité, which served admirably in the siege of 885. The chief ruler in the region around Paris (the Île-de-France) was the duke of Francia (also the Count of Paris), who controlled the lands between the Seine and Loire. Originally this was Robert the Strong, margrave of Neustria and missus dominicus for the Loire Valley. He began fortifying the capital and fought the Norsemen continuously until his death in battle against them at Brissarthe. His son Odo succeeded him but royal power declined. Paris continued to be fortified but due to local rather than royal initiative. West Francia suffered under a series of short-reigning kings after the death of Charles the Bald in 877. This situation prevailed until 884, when Charles the Fat, already King of Germany and Italy, became king and hopes were raised of a reunification of Charlemagne's empire. It had been thought that the Franks had gained an upper hand against the Vikings after the victory of Louis III at the Battle of Saucourt in 881 but in 885, a year after the succession of Charles, the Vikings launched their most massive attack on Paris yet. Danish Vikings under Sigfred and Sinric sailed towards West Francia again in 885, having raided the north-eastern parts of the country before. Sigfred demanded a bribe from Charles, but was refused, and promptly led 700 ships up the Seine, carrying perhaps as many as 30,000 or 40,000 men. The number, the largest ever recorded for a Viking fleet in contemporary sources, originates from Abbo Cernuus. Although an eyewitness, there is general agreement among historians that Abbo's numbers are "a gross exaggeration," with Abbo being "in a class of his own as an exaggerator." Historian C. W. Previté-Orton has instead put the number of ships at 300, and John Norris at "some 300." 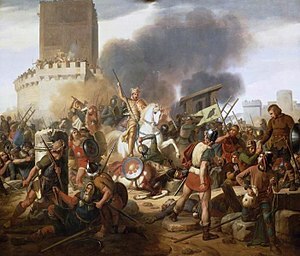 Although the Franks tried to block the Vikings from sailing up the Seine, the Vikings eventually managed to reach Paris. Paris at this time was a town on an island, known today as Île de la Cité. Its strategic importance came from the ability to block ships' passage with its two low-lying foot bridges, one of wood and one of stone. Not even the shallow Viking ships could pass Paris because of the bridges. Odo, Count of Paris prepared for the arrival of the Vikings by fortifying the bridgehead with two towers guarding each bridge. He was low on men, having no more than 200 men-at-arms available (also according to Abbo Cernuus), but led a joint defence with Gozlin, Bishop of Paris (the first "fighting bishop" in medieval literature), and had the aid of his brother, Robert, two counts and a marquis. The Vikings arrived in Paris on 24 or 25 November 885, initially asking for tribute from the Franks. When this was denied, they began a siege. On 26 November the Danes attacked the northeast tower with ballistae, mangonels, and catapults. They were repulsed by a mixture of hot wax and pitch. All Viking attacks that day were repulsed, and during the night the Parisians constructed another storey on the tower. On 27 November the Viking attack included mining, battering rams, and fire, but to no avail. Bishop Gozlin entered the fray with a bow and an axe. He planted a cross on the outer defences and exhorted the people. His brother Ebles also joined the fighting. The Vikings withdrew after the failed initial attacks and built a camp on the right side of the river bank, using stone as construction material. While preparing for new attacks, the Vikings also started constructing additional siege engines. In a renewed assault, they shot a thousand grenades against the city, sent a ship for the bridge, and made a land attack with three groups. The forces surrounded the bridgehead tower, possibly mainly aiming to bring down the river obstacle. While they tried setting fire to the bridge, they also attacked the city itself with siege engines. For two months the Vikings maintained the siege, making trenches and provisioning themselves off the land. In January 886 they tried to fill the river shallows with debris, plant matter, and the bodies of dead animals and dead prisoners to try to get around the tower. They continued this for two days. On the third day they set three ships alight and guided them towards the wooden bridge. The burning ships sank before they could set the bridge on fire, but the wooden construction was nonetheless weakened. On 6 February, rains caused the debris-filled river to overflow and the bridge supports to give way. The bridge gone, the northeast tower was now isolated with only twelve defenders inside. The Vikings asked the twelve to surrender, but they refused, and were all subsequently killed. The Vikings left a force around Paris, but many ventured further to pillage Le Mans, Chartres, Evreux and into the Loire. Odo successfully slipped some men through Norse lines to go to Italy and plead with Charles to come to their aid. Henry, Count of Saxony, Charles' chief man in Germany, marched to Paris. Weakened by marching during the winter, Henry's soldiers made only one abortive attack in February before retreating. The besieged forces sallied forth and to obtain supplies. Morale of the besiegers was low and Sigfred asked for sixty pounds of silver. He left the siege in April. Another Viking leader, Rollo, stayed behind with his men. In May, disease began to spread in the Parisian ranks and Gozlin died. Odo then slipped through Viking-controlled territory to petition Charles for support; Charles consented. Odo fought his way back into Paris and Charles and Henry of Saxony marched northward. Henry died after he fell into the Viking ditches, where he was captured and killed. That summer, the Danes made a final attempt to take the city, but were repulsed. The imperial army arrived in October and scattered the Vikings. Charles encircled Rollo and his army and set up a camp at Montmartre. However, Charles had no intention of fighting. He allowed the Vikings to sail up the Seine to ravage Burgundy, which was in revolt. When the Vikings withdrew from France the next spring, he gave them 700 livres (pounds) of silver as promised, amounting to approximately 257 kg. The Parisians and Odo refused to let the Vikings down the Seine and the invaders had to drag their boats overland to the Marne to leave the country. When Charles died in 888, the French elected Odo as their king. Odo's brother was later elected king as well. Throughout the next century the Robertians, descendants of Robert the Strong, fought the Carolingians for the French throne. Their duchy (Francia) gave its name to the Kingdom of France and the Carolingian Empire was never again reconstituted. ^ Gwyn Jones (2001). A History of the Vikings. Oxford University Press. p. 225. ISBN 978-0-19-280134-0. Retrieved 28 April 2013.